﻿ Tataki Hotel Santorini. JIMAT di Agoda.com! Ada soalan mengenai Tataki Hotel? Terletak di tengah-tengah Fira, Tataki Hotel merupakan tempat yang sesuai untuk meneroka Santorini. Dari sini, tetamu boleh menikmati akses mudah kepada semua yang bandar meriah ini boleh tawarkan. Juga terletak berdekatan adalah Muzium Pra Sejarah Thera, Inez, Pelican Tours & Travel. Ambil kesempatan daripada pelbagai perkhidmatan dan kemudahan yang tiada tandingan di hotel Santorini ini. Wi-Fi percuma semua bilik, khidmat bilik 24 jam, Wi-Fi di tempat awam, tempat letak kereta, khidmat bilik merupakan beberapa kemudahan yang membezakan Tataki Hotel daripada hotel-hotel lain di bandar. Alami bilik dengan kemudahan berkualiti tinggi sepanjang anda menginap di sini. Sebahagian bilik menyediakan televisyen skrin rata, penyaman udara, pemanas, kalis bunyi, telefon untuk memudahkan tetamu berehat dan kembali bertenaga. Hotel ini menawarkan banyak peluang rekreasi yang unik seperti tab panas. Dengan lokasi yang ideal dan kemudahan sepadan, Tataki Hotel sangat memuaskan hati. staff friendly, allow me to check in early, room and shower room are spacious, bed and pillow are comfortable. water heater is strong, air cond with heater function. this place is quiet and nearby to bus station. restaurants and shops are just outside the hotel. provide kettle, tv and fridge. Hotel receptionist (Daphne) was extremely helpful with printing our boarding passes for our flights the following day, as well as getting us a taxi and driver to take us around for the day and then to the airport at the end of the day. The room, while small and bare bones, was extremely clean with a comfy bed and clean sheets. Wifi worked well, and check-in/out was quick. The hotel is located in the middle of everything in town which was great. On the flip side, there was a bit of noise (didn't bother us) late into the night as there are bars/clubs nearby. Minimal price to pay for the central location. I had a bad fall while getting my baggage on the ferry once arrived in Santorini. My lip was cut and bad swelling on my right cheek bone. I needed medical help. Igli from Tataki came to get me, brought me to hospital even waited with me. As the wait was long, he went back to resume his duties at the hotel but he made sure my bags were in my room and left his no at the hospital to call him when I was done seeing the dr. That is service above all and he really was 'my angel'...he made sure my stay went well in spite of the fall and me going around with a dark bruise and swelling. You did good Igli!! Host was very helpful for us, although there was an issue with the payment as the host insisted for me to foot the hotel payment whereas I had already paid Agoda. Finally, Agoda managed to refund back to me. The young guy serve us very well and patiently. The hotel is located at Fira which is convenient to access to night life, bus station, super market, vehicle rental and etc. The hotel is clean and well maintained. Will come back again for next trip. The place is centrally located. Very near to everything. The bus is 3mins walk. Surrounding the area are restos, shops etc. Lots of things to see around. The room is big and clean. Daily cleaning was done. The sitting area outside the rooms is also cool. Staff are very friendly and helpful. Thanks Daphne for the warm welcome and warm goodbye and sending us to the port. Great service indeed! Highly recommended! Overall, it was disappointing and I felt like we truly overpaid for this location. The location is good, but we did not receive our room when we arrived even though we let the hotel know that we would be arriving late. We were assured that the reception would be open to greet us and that it was open 24 hours...that was not the case. We literally slept outside from 4am - 7am until one of the staff members found us and brought us to our room. We paid for the two FULL nights...I emailed the hotel asking for some sort of reimbursement and I did not recieve a reply. Honestly, the room was clean. the location was decent ( but very loud, which isn't always a bad thing). Staff were disappointing and not sympathetic, and there arn't really any "facilities" to rate. Easy to locate. 8mins walk from bus station in Fira. Hotel receptionist is welcoming and helpful. Single room is adequate for a single person. Large bed for single room. WiFi is good. Small safe, mini fridge and kettle. No breakfast included. Cons is bathroom floor tiles is extremely slippery. Limited TV channel. And surrounding pubs will play music to 2 or 3am?? Lovely little hotel right in the middle of the retail area of Santorini. Rooms are elegant and clean. Staff are very friendly and helpful. Great spot to stay - and affordable! Great location, but that is where the pros ended. On arrival, we were told we had to pay 2€ but we're not given clear reason as to why. When we were taken to our room, we realised the fridge was turned off and ice had melted, causing it to leak out water everywhere. The air-conditioner was working fine until the second morning, when we realised it was dripping water down the walls and all over the floor. We told the hotel reception and the guy was acting as if it was impossible to happen but said he will get it fixed. As we came back to our room several hours later, the air conditioner still had not been looked at. We went to reception to find the hotel manager, who was lovely, and she got it fixed straight away. The glass door to the bathroom would not close, and when you tried to close it, it sounded like the glass was cracking. The reception staff were hard to find, as they were never in the reception. There is no phone or bells to call anyone. 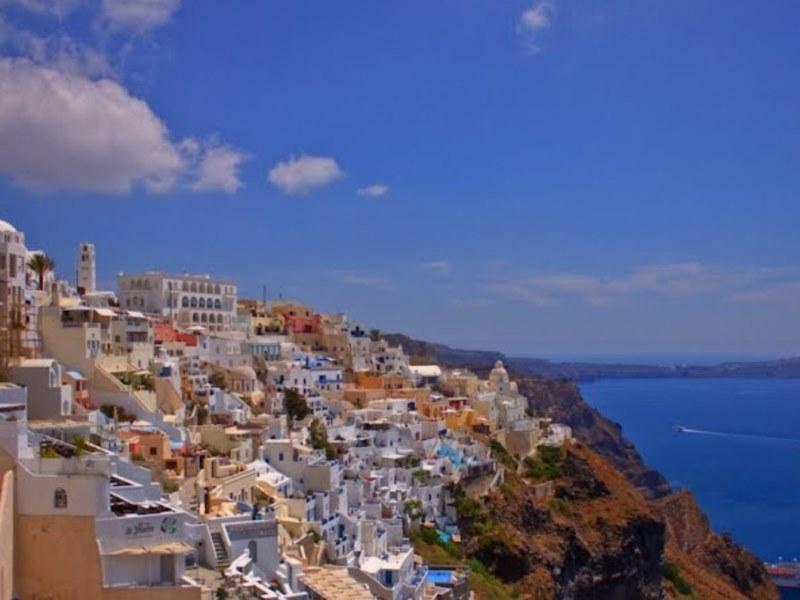 The hotel locate in the central of Fira and is very close to many famous spots. Besides, the staff was kind and help us a lot to facilitate out trip. The place is near to the Fira shopping center and it inside the Fira town, a very great view but it is not east for traveler who carry big luggage. This place is near the bus station (Fira to Santorini airport and vice versa) and taxi station, which are both in the town proper. There are many food stalls and restaurants so you won’t be hungry. We went here in December and during that time, visitors in Fira are not that many. Tataki is a good place to stay since it also offers a beautiful view of the sunrise and the sunset. There are also three cute house dogs so make sure you give them some pita.